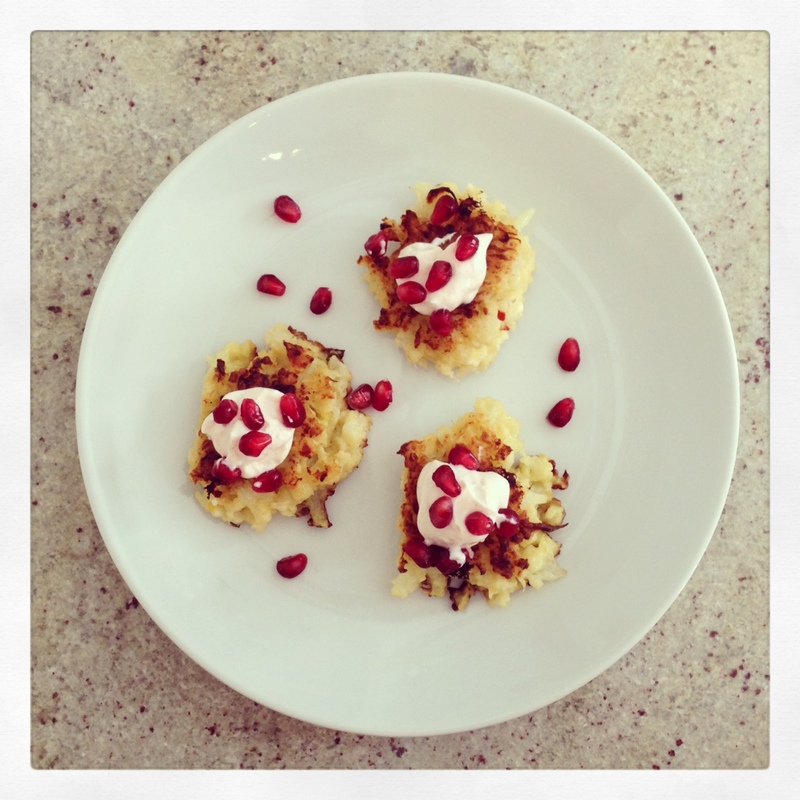 Fellow cauliflower lovers, I have a fun recipe for you! It requires a few bowls and a little bit of work, but it’s totally worth it in the end, I promise. 1.) Bring a large pot of salted water to a boil. When it reaches a boil, add the cauliflower and cook for 5-6 minutes, until it is tender but still has a bit of a bite. Remove the cauliflower to an ice bath, and allow to cool for a few minutes. Once the cauliflower is cooled, drain it and spread it out on a kitchen towel-lined baking sheet, so it can dry out. 2.) In a large bowl, whisk together the egg, grated garlic, and lemon zest. Add the cauliflower to the bowl, and use a potato masher to lightly mash it, until it is broken up into mostly pea-sized pieces. Mix the mashed cauliflower and egg mixture until everything is thoroughly coated. 3.) 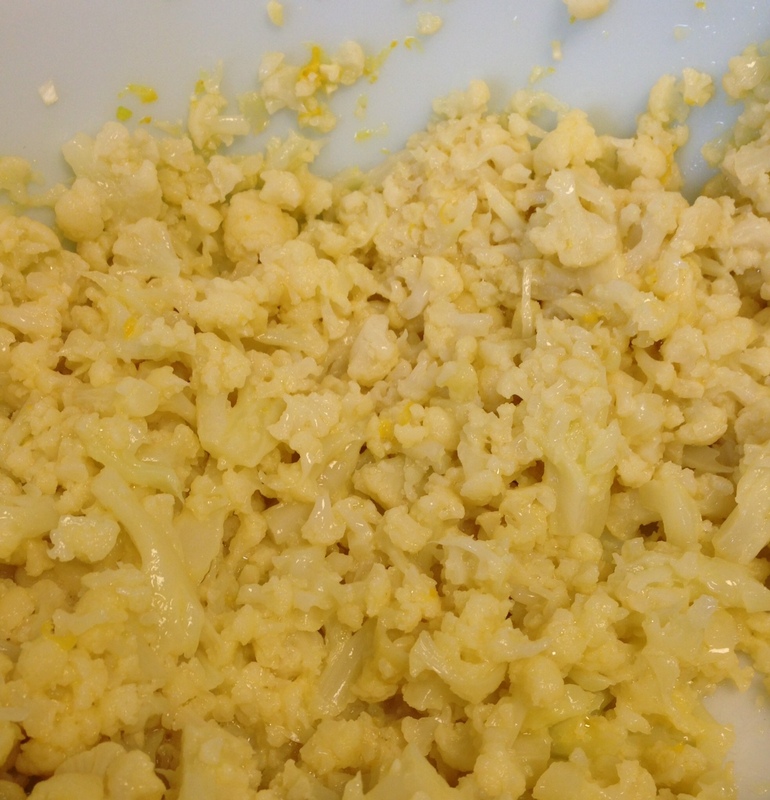 Add the crumbled feta to the bowl, and use a spatula to fold the cauliflower mixture and feta together. 4.) In another small bowl, whisk together the flour, salt, baking powder, and red pepper flakes. Sprinkle the flour mixture over the cauliflower feta mixture, and mix with a spatula until all the flour is moistened, and all the cauliflower is evenly coated. 5.) Heat a large skillet over medium to medium-high heat, and add a couple tablespoons of olive oil to coat the bottom of the pan. Once the oil is hot, drop the cauliflower mixture by rounded tablespoons into the pan, and flatten the mounds slightly once they’re in the pan. Allow them to cook on the first side for 2-3 minutes, until the bottom is golden brown; then flip the fritters, and allow them to cook for an additional 1-2 minutes on the second side. 6.) Remove the fritters to a paper towel-lined plate to absorb any excess oil. If you’d like, you can place a foil-lined baking sheet in a 200° oven, and transfer your finished fritters to the oven to keep them warm as you keep frying. 7.) While your fritters fry, mix your greek yogurt, smoked paprika, and smoked salt together. 8.) 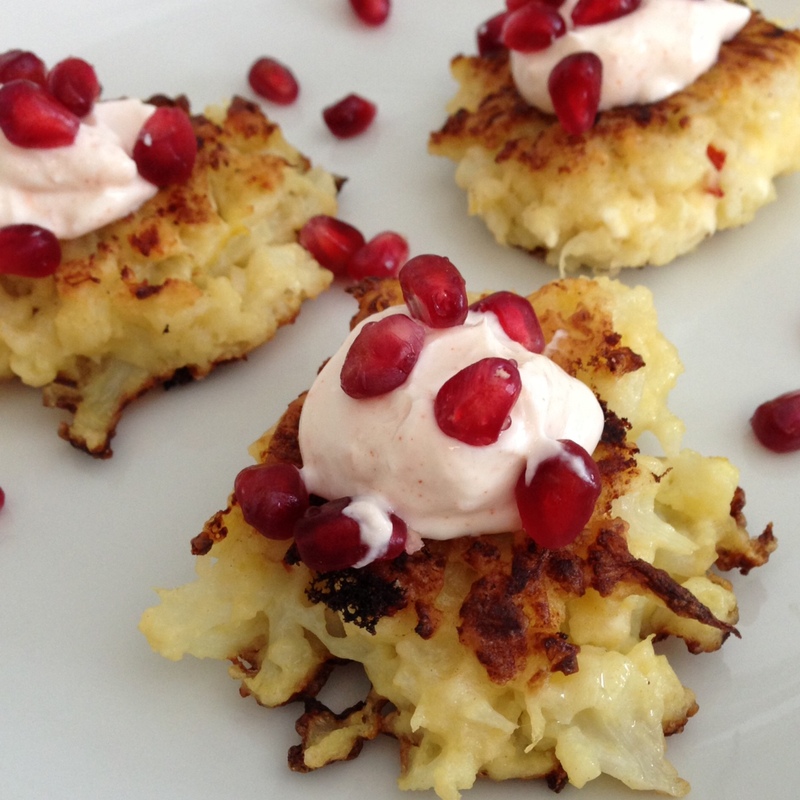 When all the fritters are finished, top each one with a dollop of the smoked greek yogurt, and a sprinkling of pomegranate seeds, and serve! My husband and I LOVED these. In fact, we ate them for lunch one Saturday… as our meal. We may or may not have polished off the entire batch. There’s a nice salty bite from the feta, a bit of spice from the red pepper flake, some smoky richness from the yogurt – and to finish it all off, the fresh, tart flavor of the pomegranate seeds! My husband didn’t love the pomegranate seeds so much, but I thought they were the perfect finishing touch. Your mileage may vary. These would be great as a side dish for a simple roast chicken, or some great burgers. They would also make a nice appetizer, provided it’s in a sit-down, plate-and-fork setting – I’m not sure how well these would work as finger food!